The MultiCuber can handle Rubik's puzzles up to 6x6. I'm going to stick with the 2x2. Alright robots, I’ve had enough. You weren’t satisfied with defeating all but the fastest humans in the classic Rubik’s cube, you had to go and rub it in. 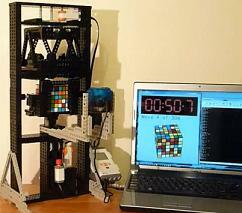 The latest Rubik’s cube solving Lego monstrosity is called the MultiCuber and although it’s constructed out of nothing but Mindstorms components and a laptop, it can solve 2×2, 3×3, 4×4, and 5×5 cubes all in the same build! As if that wasn’t enough, a larger version solves the dreaded 6×6 Rubik’s. We discovered the MultiCuber when its creator, David Gilday (IAssemble), wrote us an email to brag about its puzzle solving might. Consider us impressed, sir. Watch the MultiCuber in a four cube relay followed by a grueling solve of the 6×6 in the videos below. As always I’m impressed by the versatility and capability of the Lego Mindstorms system. Yet, while robots like the MultiCuber are nice accomplishments, none have what I would consider serious applications. Were not going to be seeing a Lego surgical robot, or a Lego spy drone. Even if we did, they wouldn’t perform their tasks well enough that you’d actually want to use them. But doesn’t the talent demonstrated by these enthusiasts suggest that they are ready for some more serious hardware? There are, of course, varying levels of robot kits that offer more specialized (and costly) parts capable of more professional quality builds. We’ve certainly seen our share of cool robots built from these products. What I’d really love to see, though, is high level robot companies (iRobot, Willow Garage, ABB, etc) harness the power of these not-so-amateur engineers. They obviously have the time and the ingenuity (not to mention some disposable income) to take advantage of whatever products you throw their way. Why not develop a special line of robot supplies for the amateur engineer ready to turn semi-pro? If experience is any guide, we’d get some really fun, and insane, results. *Note: David Gilday and Mike Dobson (creator of the CubeStormer) are friends, and it’s Dobson’s music you hear in the background of the MultiCuber videos.